Our world is filled with items that are produced without thought of how it will affect our bodies or the environment. It puts a heavy burden on our bodies and is very challenging to stay away from using these items because they make them so cheaply and are convenient to purchase. I call it death by 1000 cuts.... However, with a little bit of research and effort, you can find ways to avoid these items and take charge of your health and the environment. 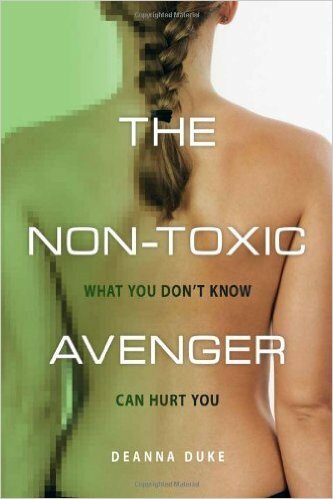 This detailed book goes into great depth about one woman's efforts to remove toxins from her family's diet and household due to her husband's cancer and child's autism like disease. She takes it to the extreme in some cases but her dedication to this cause is exemplary and deserves a read. Most of us turn a blind eye to the startling array of chemicals lurking in everything from shampoo to baby bottles to the money in our wallets, choosing to believe that government agencies ensure the safety of the products we wear, use, ingest, and breathe in daily. Yet the standards for product safety in North America lag far behind those of other countries. We frequently hear that a substance we've relied on for years turns out to have serious effects on our health, the environment, or both. After coming to terms with the fact that the autism and cancer which had impacted her family were most likely the result of environmental toxins, author Deanna Duke undertook a mission to dramatically reduce her family's chemical exposure. She committed to drastically reducing the levels of all known chemicals in both her home and work environments, using the help of body burden testing to see what effect, if any, she was able to have on the level of toxins in her body. Follow Deanna's journey as she uncovers how insidious and invasive environmental toxins are. Learn about your day-to-day chemical exposure, the implications for your health, and what you can do about it. And find out whether the author's quest is mission impossible, or whether she is ultimately able to improve her family's health by taking steps towards leading a chemical-free life. Deanna L. Duke is an environmental writer, urban homesteader, and author of the highly acclaimed environmental blog The Crunchy Chicken.